Hans Mielich. Portrait of a Woman aged Fifty-seven. 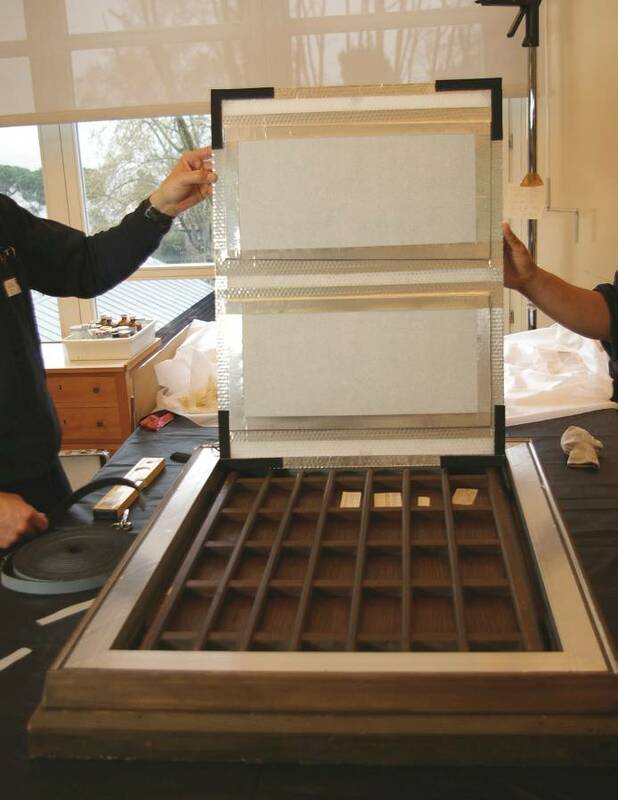 One of the habitual tasks of the conservator-restorer of the museum is to act as a courier. It is a job that doesn’t only involve accompanying the work to be loaned for a temporary exhibition but also writing the reports about the state of conservation, of the interventions of restoration (if necessary), supervision of packing and of the final installation of the work in its new temporary location. Often also, as with the painting we were dealing with, the opportunity is taken to carry out scientific studies of the piece such as a radiographic examination or with an infrared reflectography which, along with the interpretation of the specific photographs for the restoration carried out with ultraviolet and raking light, and macro photography, they help to get a more complete vision of the piece. 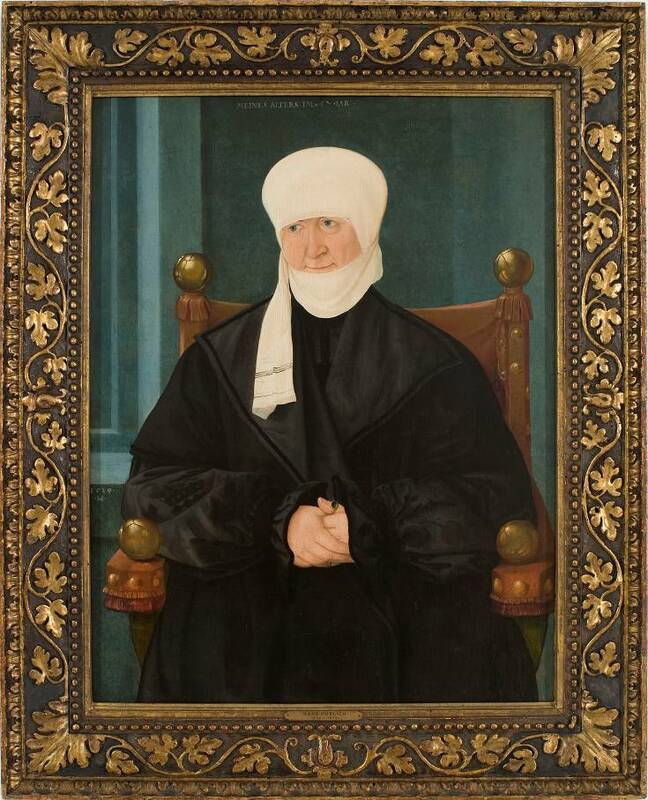 One of the last courier trips I did was to accompany the Portrait of a Woman aged Fifty-seven, from 1539, from the Thyssen-Bornemisza collection, as far as the Castle of Huis Bergh where the so-called Portrait of a mature man is conserved, the partner of our painting. 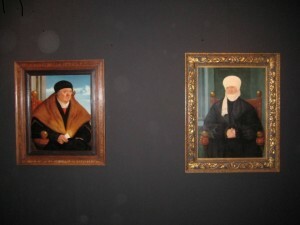 Both are oil paintings on wood, done by Hans Mielich and of similar dimensions. Considering that the castle didn’t have optimum climatic conditions, and having consulted the owners of the work, it was considered opportune to take advantage of the frame to turn it into a display case that would protect it and guarantee its climatic stability during the trip and stay in the temporary exhibition. The castle can be found within the Dutch town of Heerenberg, very close to the border with Germany. It dates back to the 13th century and has undergone numerous enlargements and reforms. The last one was after 1939, the date in which there was a major fire which affected the whole of the building. Castle of Huis Bergh. Seen from the outside and central courtyard. Currently the castle is a foundation with an important artistic collection that, among other initiatives, organises temporary exhibitions. The latest one, entitled Man Seeking Woman! 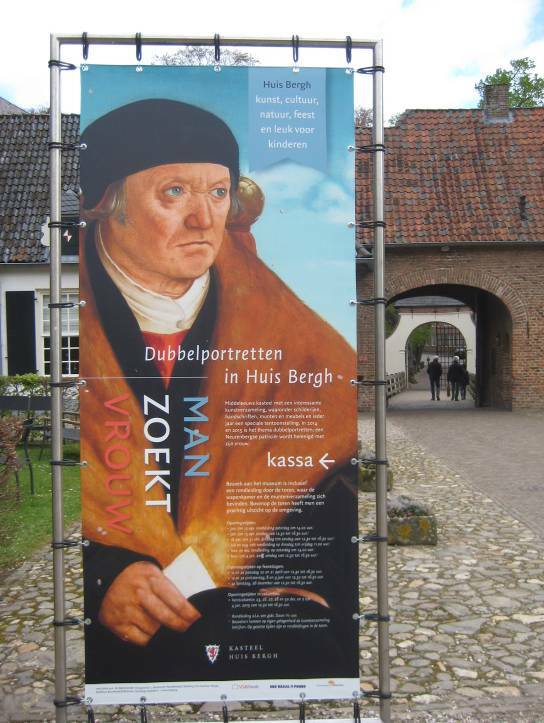 Double Portraits at Bergh Castle can be seen until 15th October this year and which in the spring of 2015 will move to the Fundación Thyssen-Bornemisza of Madrid. 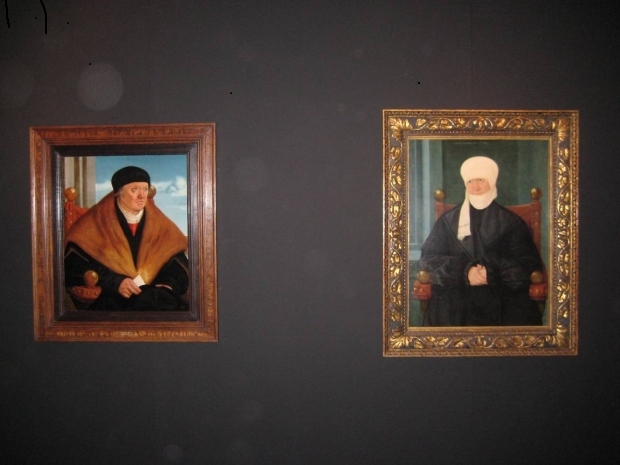 The central part of the exhibition are the pair of portraits painted by Hans Mielich after being separated for many years are now being reunited, and are exhibited side by side,glancing at each other, in this exhibition which is almost monographic, but with strong symbolic contents. The identity of those portrayed is unknown, but apparently they could be a wealthy couple from the Bavaria region, just as customers of the painter tended to be. 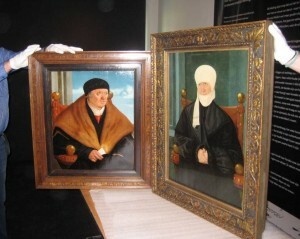 When the crate was opened, and the two portraits were placed next to each other, an instant sense of expectation was produced. It was the moment when the two portraits were reunited, and the restorer of Huis Berg and I myself were able to analyse and compare the pictorial process and the state of conservation of both pieces. The moment of the reencounter. The male portrait was verified and restored for the exhibition, it was very well conserved and had undergone fewer changes than the female one. The intensity of the colours, the brushstrokes and the final glaze can be very clearly perceived. It was also the chance to compare the underlying drawing. In the reflectograms of the figure of the woman, carried out in our museum, two kinds of traces can be appreciated in the drawing that seemed to be done with both a dry pencil and with a brush in the medium level over it. While in the portrait of the man, as confirmed by the restorer, only the brush drawing can be perceived with a black pigment. The different nature of the supports was also highlighted: the male portrait was painted on pinewood, while the support of the female portrait seemed probably to be oak. This relevant difference is reflected, as included in the technical sheet of the Thyssen collection, by the fact that the original wood of the female portrait was replaced in a previous restoration and that it is a painting which was transferred to a new oak support. The final display in the exhibition room. The trip to Heerenberg was not simple, given that it took two days of many hours travelling by plane, train and bus. Nevertheless, it was very satisfactory to participate in the meeting up again of this pictorial couple that had been separated for so many years. It would be nice to know if the portraits are of the same opinion about this new reunion.